Known as “craze lines,” minor cracks and chips are the most common type of cracked teeth. Cracks and chips need minor repair because they only concern the surface (enamel) of a tooth. A simple cosmetic buffing and polish will do the trick! This type of cracked tooth causes major damages and needs major repair. This tooth break reveals your tooth’s nerve and causes extreme sensitivity. 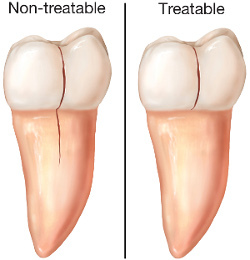 Usually, a tooth that is cracked to this extent requires root canal therapy and a dental crown for an aesthetically pleasing finish. Please visit us immediately if your tooth has serious breakage. A decayed cracked tooth is exactly what it sounds like. Decay, steaming from the inside of your tooth, begins to spread and deteriorate the tooth. Visiting us twice a year or when you feel tooth discomfort is imperative because the cavity must be filled before it causes greater dental problems, such as tooth loss. Some warning signs that could signal a cracked tooth are pain while chewing and sensitivity to hot and cold liquids. A cracked tooth becomes seriously dangerous when your tooth is cracked all the way down to the dentin and your nerve endings become exposed. This causes a lot of discomfort and the formation of a dental abscesses (pocket of puss caused by infection). Dental fact: Be aware that molars are the teeth that are mostly likely to crack because they are the places where most of the force it when chewing. Obviously, it is best to avoid getting a cracked tooth. Protect your teeth from grinding them at night with a mouth guard. Grinding your teeth causes wear, uneven surfaces, and chips. Avoid chewing hard candy and ice. As you know, too much hard candy and sugar can also create cavities that can break down the tooth. Maintaining good oral care and regular dental visits are key to keeping your teeth healthy! No clenching! Doing so can place unnecessary pressure and force down on your teeth. This can wear down their surfaces, causing them to become weak and possibly crack. It is always important to wear a mouth guard while playing sports, especially during contact sports such as football. Falling on or being hit in the mouth can cause serious damage to your teeth if not properly protected. At The NJ Center for Laser and Cosmetic Dentistry, your oral health is our number one priority! Please visit us if you feel any discomfort and think you may have a cracked tooth, even if it’s a minor one, because it can cause greater problems down the road. Call today: 973-244-2424 or request an appointment online.